Our next destination, “La Higuera”, was only 300 kilometers from Sucre, but half of them were on a dirt road and not on asphalt. 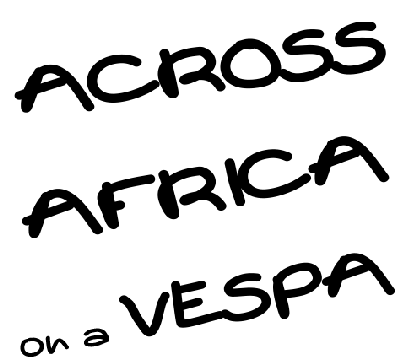 The other thing that we couldn’t get out of our mind was the steepness of some parts of the route and the question “Will the vespa make it this time?”. We started early from Sucre so to avoid the huge traffic on the streets. The last thing we wanted was a burnt clutch. Fortunately, we left the city center with no problems. We also made it to buy fuel without much fuss – the lady in the gas station sold it on the normal price (as usual, we had to park the vespa far from the gas station and go there with the jerrycan in our hands and a stupid smile on our faces). The landscape this time had changed a lot due to the mild weather and relatively low altitude. Pine trees, thyme and the warmth of the sun, reminded us of Greece. Stergios kept telling me: “Look at those pine trees, smell the air, it’s thyme!”. The only thing that worried us a bit were the cows grazing just next to the road. And while I was thinking that this may be a bit dangerous, 2 of them panicked and got on our way. Stergios easily avoided them but lost his concentration on the dirt road and suddenly…CRASH…! 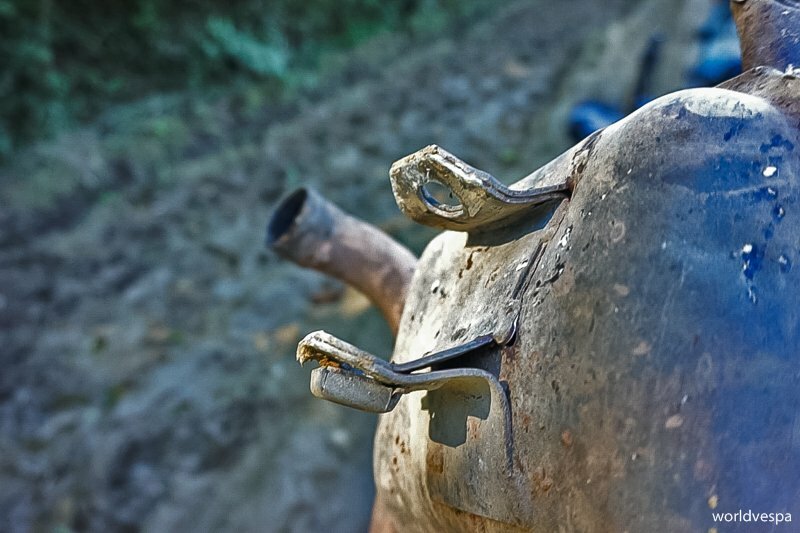 The exhaust had crashed into a rock sticking out from the dirt road. The crash was so strong that the whole exhaust moved from its place and touched on the rear wheel, completely blocking it. The cows kept staring at us in an annoyingly naive way, while we were taking all our stuff off the vespa and Stergios tried hard to mend it, hitting the exhaust with stones in order to reposition it, but in vain. At least, the carter was not broken and this was a relief. After three hours of continuous though futile attempts, we had only one choice: take off the exhaust and continue to La Higuera. From there, we’d come up with a new plan. The noise of a vespa traveling with no exhaust can only be compared to that of an airplane taking-off! I’m sure that the cows that heard us passing-by, now suffer from reduced milk production and that the villagers of the area are still searching for the lost airplane! Unfortunately, it was impossible to get to La Higuera on the same day. Just before it got dark, we found a spot to pitch our tent and spend the night. It wasn’t the best place but we didn’t have time for a more thorough research. We pitched our tend among cows’ feces but this was not our worst problem. The worst part of the story were the thousands of tiny though vicious flies and mosquitoes, as well as the wasps. After we got bitten and stung in every inch of exposed skin, we ran inside the tent where we spent the night with no food and only a little water. 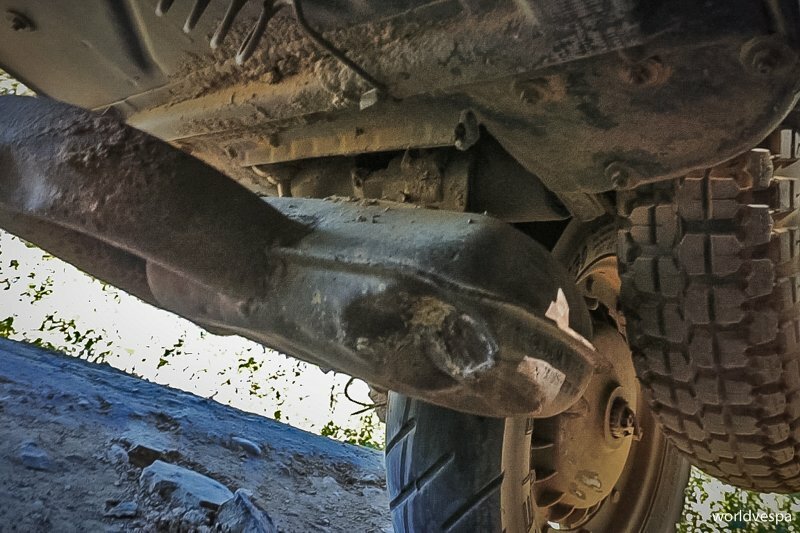 The next morning, we woke up way earlier than the lethal insects and Stergios managed to tie the exhaust back to its place using wire, hoping that it will make it to La Higuera (if only we knew that tying the exhaust with wire would be a routine for the months that followed…). The rest of the route to La Higuera was really beautiful, with a very interesting – in flora – landscape and a river flowing in a gorge, All the above “forced” us to stop and take many pictures, but the other reason that made us stop every other meter was to check if everything was under control with the exhaust. The route from the gorge to the next mountain peak we had to climb, was a nightmare to us. The road was very steep and full of curves, but miraculously we managed to climb from 800m of altitude up to 2,500m! Additionally to all these, I had started feeling the first symptoms of a…food poisoning. Dusty and exhausted, we finally got to La Higuera! We gathered all the energy we still had and “escaped” from the French owner of a beautiful (though beyond our budget) hostel at the entrance of the village, who wouldn’t even let us see if there were any other hostels around! We were now standing at the square of the village admiring the unique place. There are only about 100 people living there, but the tiny village carries a huge history on its back. 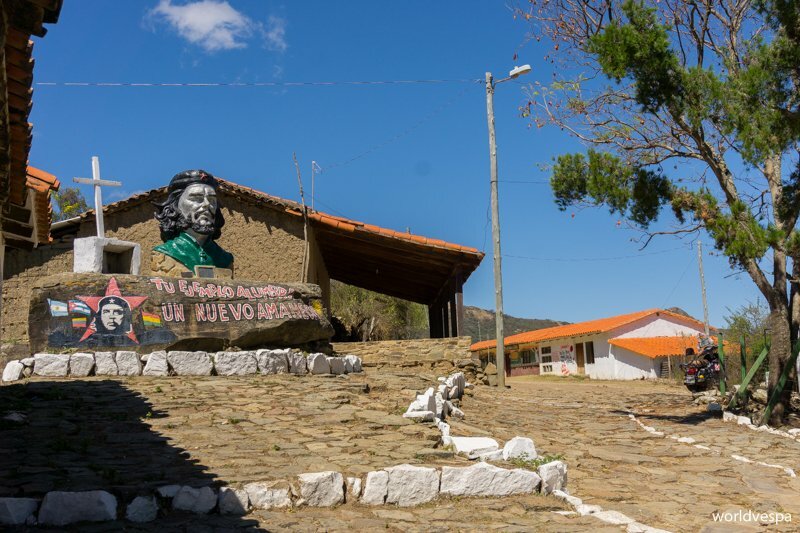 La Higuera is the place where El Che, left his last breath executed by the Bolivian army and the CIA. Someone can feel his presence everywhere around: there is a mural with his face or his quotes on every wall and 2 sculptures that no one can ignore. The villagers are aware of the importance of La Higuera and proud to show pictures from the guerrilla times. The building of the old school, where El Che was kept until he was executed is now a museum, or better – a memorial, where the visitors can learn information about the history of the armed guerrilla and leave any kind of memorabilia they wish. The 9th of October, 1967 – the day when El Che died – is the most important day for the village’s collective memory. We had read that there is a communal guestroom in La Higuera and the first thing we did was to ask if it’s available. We preferred to spend our money for the community and stay near the “heart” of the village. We soon were in our room where we could finally collapse from exhaustion! While we were waiting for the lady who was in charge of the guestroom, Stergios also had his first symptoms of food-poisoning…We locked ourselves in the room and only got out of it again, after 3 days! The news travel fast in such a small place and soon everyone in La Higuera knew about the two poor travelers who were lying sick in the communal guestroom! A lady came and told us about the two Cuban doctors who have their practice next to our room! I went there, mostly out of curiosity. How come a medical doctor from Cuba can be in La Higuera? After examining me, the doctor explained me that there is an agreement between Cuba and Bolivia with the first, sending medical staff to work there for 2 years. Medical consult, treatment and medication was free for everyone regardless their place of origin or financial status. After 2-3 days, we started feeling better and on the 4th one, we finally got out for a walk in the village. We visited the museum, where we spent some time not only reading the information and seeing the pictures but we also met a couple from Italy, members of the left political party of the country, with whom we had an interesting discussion on the European crisis. After visiting the museum, we walked and tried to find the traces of the history of La Higuera. I don’t usually refer to “energies” of places etc, but this time it’s the only way to describe how distinct and unique was this particular place. If I may talk about “energy”, I’d say that there was something in the sound of the wind of La Higuera, that had given the village a “sacredness”. Even the people contributed to this feeling of “sacredness” by referring to El Che, by the name “Santo Ernesto”. His figure wasn’t widely commercialized and everyone seemed to know all the aspects of the history of the Bolivian guerrilla. It didn’t seem to me that they were only trying to “sell” him. The few days we spent in La Higuera passed without realizing it. Our room was in the same yard with the school and the medical practice, so every time we got out to cook our meal or wash the dishes, we were surrounded by people, especially by the little pupils who were very curious about us! The couldn’t stop laughing at Stergios’ long beard and they went hysterical when they saw that he was bald! They were calling him “Santa Claus”! As for my short hair, this confused them enough and asked me if I was a man or a woman. Probably they hadn’t seen any female having short hair before (Two months later, in Peru Stergios’ reputation was restored, when a kind man told him that only true revolutionaries, like Jesus and El Che, had long beards…not Santa Claus!). 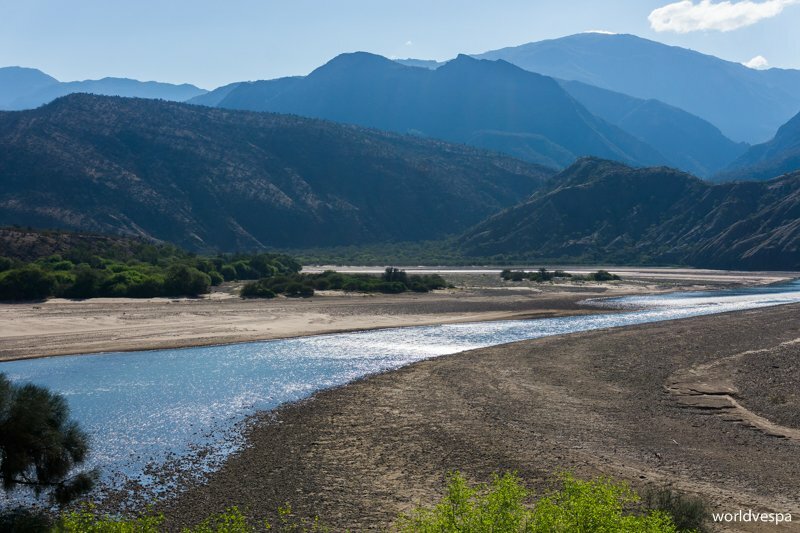 If I continue in such detail about all the stories from the trip, this text will never end, so I have to cut it short and leave from La HIguera with direction to the town of Vallegrande. What was different than usual was the fact that Stergios and I left from La Higuera separately. After some mature(!) thought, we decided that it would be better to get to Vallegrande in the most comfortable way for the wounded vespa. So, for once more I took all the luggage that I could carry with me and got to a taxi (along with another girl I met in La Higuera – a German backpacker) which would take me to the next village, Pucara. From there, it would be easy to find a bus and go to Vallegrande. We followed the same plan as we had done in Uyuni: we arranged to meet in a hostel named “Mexico Lindo”. I would go there first and wait until Stergios arrived. The trip from Pucara to Vallegrande was an awful experience and I couldn’t wait to ride the little vespa again! The bus driver, probably thought that he was a Rally Dakar pilot and the rest of the passengers, probably wanted to have the experience of a roller-coaster! I just wanted not to throw-up or fall from my seat onto the floor! When we finally made it alive to Vallegrande, I was feeling like I had been sailing for at least a week. I got to the “Mexico Lindo” hostel and started explaining to the receptionist that I’d be waiting for my partner but I didn’t have any idea when he would be coming. As usual, I had thought only the worst scenario: that Stergios would face problems with the broken exhaust and that he wouldn’t be arriving the same day…After 30 minutes, Stergios was knocking on my door! The next day, we went to a garage to repair the exhaust. After some 40 minutes of welding and accurate measuring, the exhaust was at its place and we were ready to go. Or not?! The exhaust was back in place but not at the exact spot. It was still touching on the rear wheel. With tha use of a big hammer and some aggressive repair, we managed to push it 1cm from the wheel…it was enough for us. Of course, from that point and up to day, the exhaust is our main concern as it has moved from its place about 3-4 times, but at least, we can reposition it by ourselves! 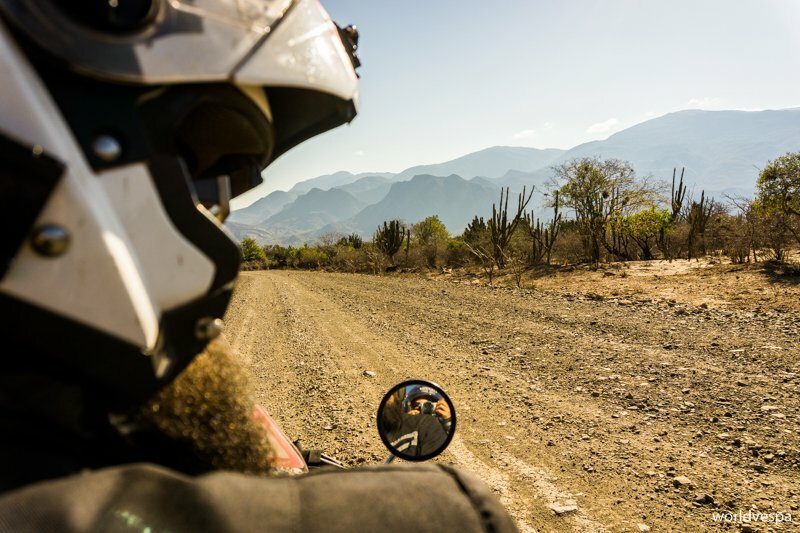 We were happy that the next part of the route – from Vallegrande to Cochabamba – was on asphalt road. We had asked and we were reassured about the end of the dirt road. We had also checked that we were about to follow the “Panamerican Highway”, so why worry? We never learned if the locals were teasing us or if it was due to pure ignorance that they gave us this kind of incorrect information. Soon after we started, the asphalt vanished, giving its place to pure dirt road of very poor quality. The main road from Santa Cruz to Cochabamba, two of the most important cities in Bolivia, was a bad dirt road. As we looked closer, it seemed to have been paved sometime in the past, but the asphalt was worn out, only to make things worse. Additionally to this, the road was occupied by trucks and all types of vehicles that made our lives difficult, how could we overtake a bus or a truck on this road and how could we stay behind it, eating all the dust. Our black clothing had become gray with dust and we found it difficult to keep our eyes open and avoid the deep holes on the road. We shouldn’t by all means hit the exhaust again! We enjoyed the beautiful landscape until…we lost it! Like if all the difficulties we already had weren’t enough, a very thick fog appeared suddenly and everything that was more than 2 meters beyond us, vanished in a white creepy silence. 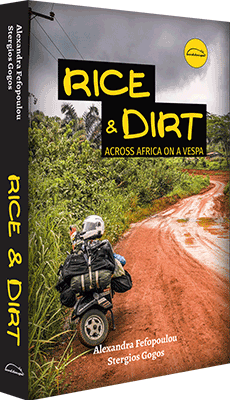 Let me remind you of the dirt road, the high altitude, the mud, the cows, the cold, the trucks and of course the not so powerful lights of the vespa…We couldn’t take out the air filter, we couldn’t accelerate, we couldn’t see. So, it was time for a walk! I can’t say I enjoyed walking in the fog. As it seemed, the trucks and buses wouldn’t slow down, so every time I heard the noise of an engine I was almost climbing on trees to save my life. Apart from this, it was the fact that I couldn’t see anything beyond my nose, so I felt insecure and exposed. I couldn’t calculate any distance or see where Stergios had stopped. Of course, Stergios was fine, waiting for me in few kilometers’ distance. Soon, we got to a small village where we bought “homemade” gasoline by a lady who was the only one to sell fuel in the area and asked her if there is any place where we could pitch our tent for the night. She suggested that we’d better go on for some kilometers in another village where the cold weren’t that harsh. We then realized that the village where we had stopped was called “Siberia”! Siberia was the last place before the road started descending, so the thick fog was about to end. She was right, after some kilometers the fog wasn’t that thick anymore and we soon entered a tropical forest zone. The humidity, along with the cloudy sky, the mud on the road and the tropical vegetation, made the scenery even more creepy than before, but I have to admit that I liked it. 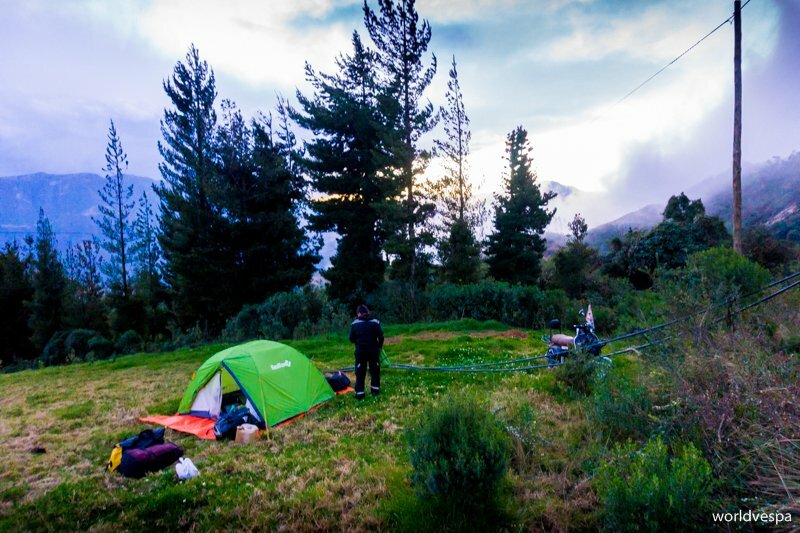 The cold wasn’t harsh, the rain which had been threatening us for the last few kilometers never came, so we decided that spending the night in nature would be the best idea. We found a nice spot to pitch the tent and we were soon ready to cook our dinner and enjoy the view. The truth is that in Bolivia, we often couldn’t resist the temptation to stay in guesthouses (“alojamientos”) as they were really cheap – we even paid 4 euros for a double room! – and we had missed staying in our tent! The next morning we were off to Cochabamba. A big city, known to us from the people’s fight against the privatization of the water supply system. We had seen films and documentaries on the particular subject, but apart from this, we didn’t know what to expect. There were though some nasty surprises hidden there. 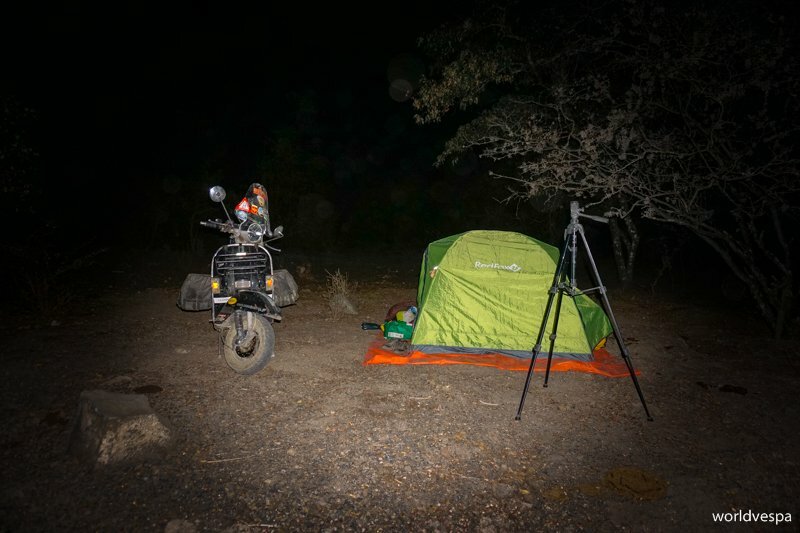 We stayed in Cochabamba about 20 hours in total, with the 2 of them trying to enter the city center, 3 hours trying to find a place to spend the night and 2.5 trying to get out of the city on the next day! The traffic was beyond chaotic! While we were desperately trying to get to the city center, we realized that the reason everything was stuck, was an open-air market blocking the main road. Not at all unusual in Bolivia. The situation brought Stergios memories from the big cities of Africa where the people didn’t seem annoyed at all and continued their day like there wasn’t any problem around. He soon made the appropriate shift in his way of driving and forgot any “western-type” rules. He started driving aggressively and this proved to be a success because no Bolivian driver expects any respect to the rules. So, driving like the locals was the best way to survive! Our next goal, after getting to the city center was to find a place to stay, but all the hostels addressed to non-Bolivians were a bit beyond our budget and we couldn’t spot the area with the cheap “alojamientos” (guesthouses). When it started getting dark, we were so tired that we decided to stay in the less expensive hostel we had found. Unfortunately, the 25 euros we paid for the night (with an invisible breakfast included), was a ridiculously high price – taking into account that the place was an old building with no signs of maintenance. Needless to say, we would be getting out of there the next morning, as soon as possible! It was a sunny Sunday morning and we usually preferred Sundays for our departure from the big cities – less traffic. However, what we didn’t know was that there was a big “fiesta” in Cochabamba that day. It was some Saint’s day and all the population of the city had gathered to the big “fiesta” – where else?- in the main exit road to La Paz! We never understood why they had to close the main entrances/exits of a city every time they wanted to celebrate…We just had to accept it as a fact and ask whether there is some celebration every time we wanted to leave a place – there was almost always one! After 2.5 hours of unsuccessful attempts, we finally made it out from Cochabamba and headed to La Paz. We were planning to be there in two days time. What else could happen?! In order to get to La Paz, we had to climb up to 4,500m of altitude again, but this time I didn’t need to walk because we just took out the air filter (possible to do this only on asphalt roads) and the vespa became as strong as a lion! It was the 15th of August and as we were used to the weather conditions of the north hemisphere, freezing cold and snow in August were new to us. The Andean “altiplano” – plateau was really impressive: strong winds, scarce vegetation, llamas, remote villages. We were never fed up with this kind of view. We spent the night at a village called “Caracollo” and on the next morning, when we went out to find some gasoline, things got a bit tricky. The gas station was emptied and the “homemade” fuel was ridiculously expensive! We had enough gasoline for 150-180 kilometers and we were sure that finding fuel in the main route to La Paz wouldn’t be a problem. If only we knew…We kept asking in every village but in vain! 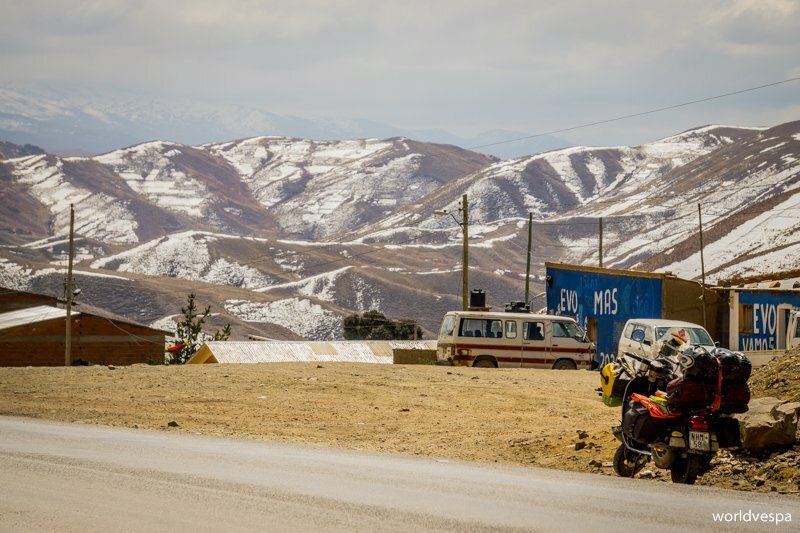 After having used even the last drop of gasoline from our jerrycan, Stergios started driving as economically as possible and we managed to get to a small town where there were 3 gas stations. The first one was closed and at the second one we were told that they would only sell us on the “international” price – even themselves suggested that we should try to go to the third gas station and buy on a more reasonable price. I grabbed the jerrycan and left Stergios and the thirsty vespa some 100 meters from the third gas station. When I got there, to my surprise, I faced a new problem in buying fuel! At first they wouldn’t sell me any, but when I kindly insisted I was told that I could have only 5 liters. I bought the 5 liters on a price that wasn’t neither the “international” nor the “local” and got to Stergios. We emptied the gasoline into the tank and went back to buy 5 more liters. Apparently, this didn’t seem absurd to them! After this, I made Stergios promise me that this was the last time I bought gasoline. The next was his turn! As usual, getting into a big Bolivian city was a nightmare and for once more we had to be brave! 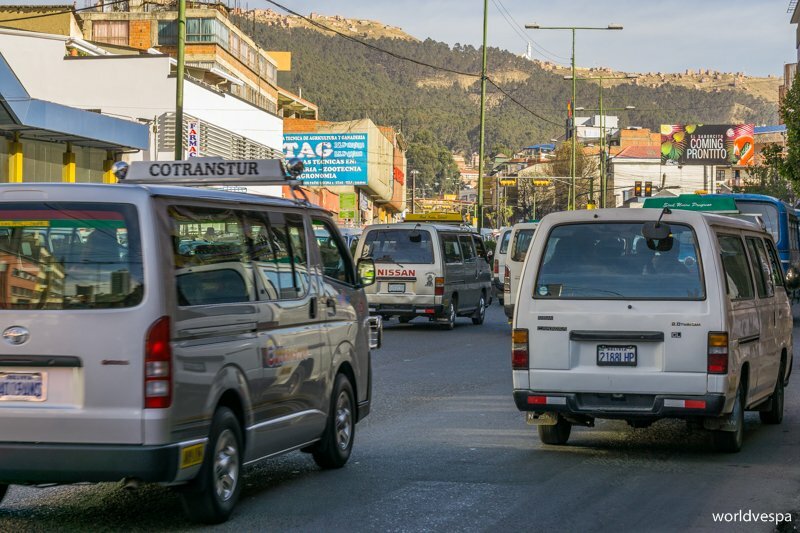 Entering the city – more precisely, the chaotic and “poor” El Alto – there was a huge open-air market blocking the street and we soon got lost, trying to avoid it. We finally managed to reach La Paz from an alternative route, which was going down from a steep slope – impossible to climb it again. El Alto – the suburbs and La Paz have a difference of 500m of altitude between them. 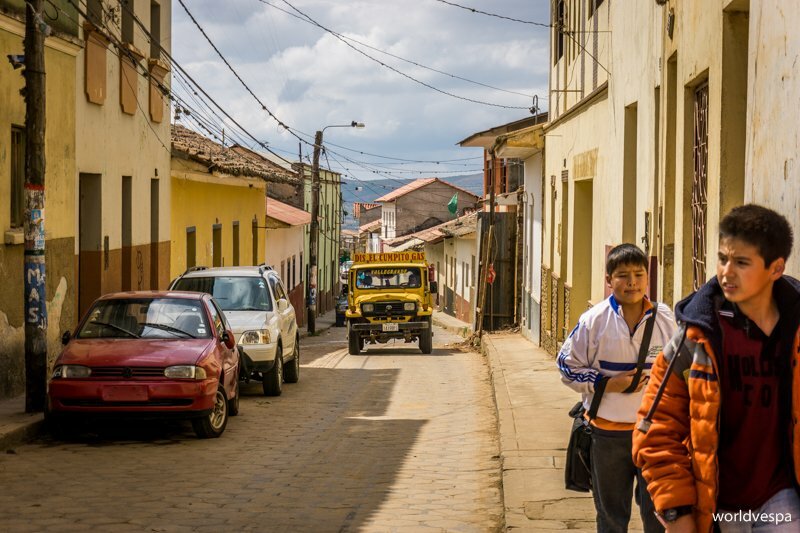 El Alto is the suburban area “hung” on the steep slopes around La Paz, which makes the whole place very distinct. 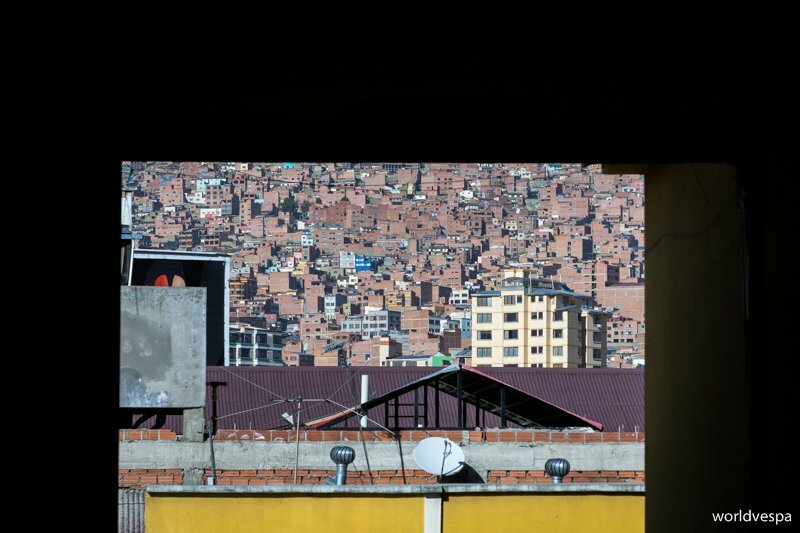 El Alto is so densely inhabited, with brick houses constructed one next to another, that if someone looks towards it from La Paz, they can’t see anything but bricks. The night view is even more interesting as when it gets dark, the thousands of lights of El Alto shining from above, give a festive atmosphere to the whole city of La Paz. We spent only 4 days in La Paz and what we did during our stay was walking, taking pictures and enjoying every kind of street-food we could find in its crowded streets. The two things we’ll definitely remember from La Paz were its chaotic traffic and air pollution, as well as its delicious salteñas – fried empanadas stuffed with meat, vegetables, chicken or egg. What was new to us (and added to the whole traffic chaos) were the minivans used as means of public transportation. Their drivers were completely unaware of any driving rule and the constant noise of their horns informing about their presence, could drive any unaccustomed visitor crazy! From the moment we reached La Paz, we were thinking about how we would climb up again. We didn’t know how steep was the main road driving out of the city and we didn’t trust to ask anyone (every time we had asked about information on the road conditions, they were far from accurate). Under any circumstances, I was preparing myself for some walking or at least, I could take a taxi/minivan and meet again with Stergios at El Alto. Fortunately, we didn’t need any of these plans as the main road wasn’t that steep, so the vespa easily managed to climb. Leaving our hostel in La Paz, we had the nastiest surprise of all! While Stergios was outside preparing the vespa, I was bringing our luggage and left them at the stairwell of the 1st floor IN the building. When I took one of the bags to bring it to Stergios, I smelt something awful. We had accidentally put the bag on a pile of sh*t! We couldn’t have imagined that in a city full of public toilets someone had entered a building and did the job! With a feeling of utter disgust, we cleaned the bag and…I won’t give any other detail on the awful experience! We were now “clean” to go. We had our tank and jerrycan filled with gasoline – bought by the kind owner of the hostel, because they wouldn’t sell us at any gas station, we had taken off the air filter and we were ready to climb to El Alto. As usual, we got stuck! This time due to construction works on the main road as well as the expected open-air market! The situation got worse because of the hundreds of minivans driving like crazy. When later, we read an article on a travel blog comparing El Alto to “Mordor” from the Lord of the Rings, we couldn’t have agreed more! Our days in Bolivia were coming to an end. Our next destination was our last one in this unique country and we were a bit sad to leave it. We had made it! We had left from El Alto and we were on our way to the small town of Copacabana. The route was easy and interesting and we soon saw the lake Titicaca and for many kilometers we were driving next to its shore. Lake Titicaca is so big that in some parts of it, it’s impossible to see its opposite shore and the view is more of a sea than of a lake. Some kilometers before Copacabana, the road was ending at the shore and we had to get on a wooden platform – a big raft – to continue at the other side. We got to Copacabana without a hitch. Our plan was to stay there some days before we continued to Peru. We had read that Copacabana is a place with many tourists and we expected to be hard to find a cheap place to stay, but contrary to what we thought, Copacabana was a nice small town providing many options for everyone! Our one-week stay easily became a three-week one and when we finally decided to go, the hotel owner and the only employee were sad and told us they’d miss us! Copacabana, was the ideal place to take a break from the trip, have some rest and write for the blog. The hostel was quiet and every morning the smiling employee was coming to greet us. He always had a joke ready so that we all could laugh but the funniest thing for him was Stergios’ baldness! We never understood why, but in Bolivia the lack of hair along with a long beard was something to laugh with! 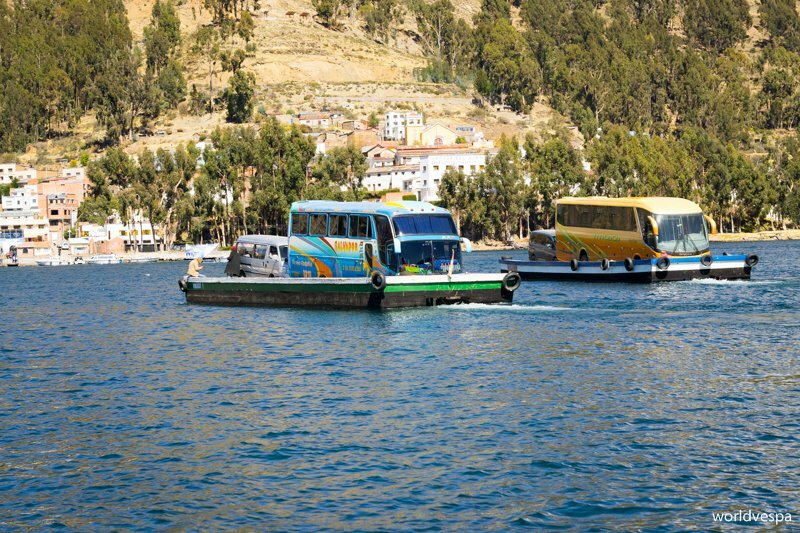 In the small town o Copacabana, there are two streets that lead to the lake. The first one is full of souvenir shops and bars/restaurants with “Happy Hour” services. Obviously, everything is a bit more expensive on this street than on the second one, which is addressed more to the locals that to foreigners. Imagine where did we spent almost every day of our stay! We visited all the local restaurants and we tried us much street-food as possible. The prices on the “local” street were much lower than those of the “tourist” street and we took this seriously into account! Every weekend, we were going to the lake shore to eat the delicious trouts that were served in small “humble” restaurants and we enjoyed many shorter or longer walks at the lake. During weekends, things got more interesting in Copacabana. People from Bolivia and from the neighboring Peru, gathered there to worship the “Virgen de Copacabana”, the patron of the town. As we assumed, the specific “Virgen” was also a vehicle expert(!). We were amazed by how many cars along with their drivers and their families were gathered in front of the church for the ritual of benediction! Tens of vehicles on a row were patiently waiting to be blessed by a priest. 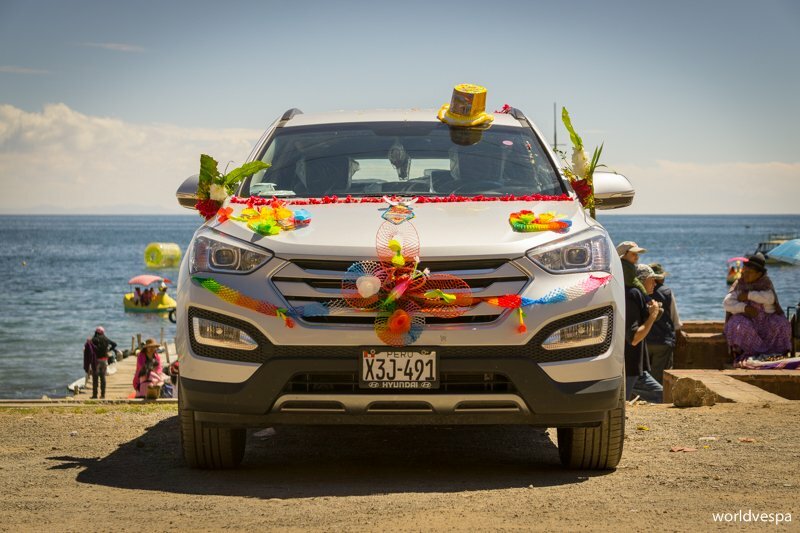 All types of vehicles – cars, trucks, motorcycles – were shining, decorated with flowers and after the benediction were showered with cheap bubbly wine! After the whole procedure, the families headed to the restaurants on the shore where they would celebrate eating trout! 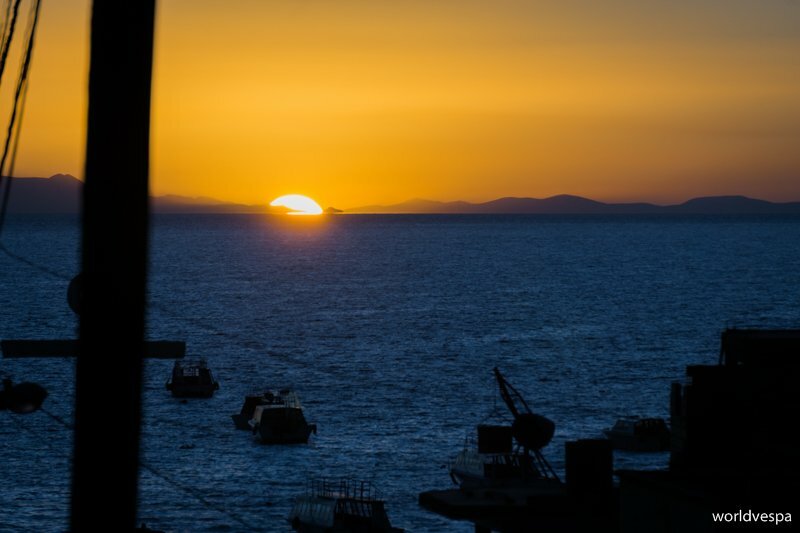 Our stay in Copacabana was the ideal “closure” for our trip in Bolivia, this amazing, unpredictable country. Even on our last day there, Bolivia was determined to surprise us for once more! We said farewell to the hotel owner and to her employee, put some gasoline – unfortunately at the “international” price (but, well, it was the only time we were charged at the “international” price) and headed to Peru, which was only 10 kilometers away. Back at the hostel, the owner had told us something about some festivities in a church at the border and that it was best to go on that day and not on the following one. This time, we were sure that she was just exaggerating. It was an international border, it was impossible to be blocked! Of course, when we got there, we realized that in Bolivia it is highly possible to block an international border only because of a “fiesta” on some Saint’s day! Hundreds of people from Bolivia and Peru, had gathered there: street vendors, music, food and dances! It was hard to cross through all these people even on a vespa. I got off and with a huge smile on my face, I tried to open our way through all these people! In a while we were at the immigration office and after the border and customs control, we set foot (and wheel) on Peru! We had left behind us an amazing country with breathtaking landscapes and nice people who only need a sincere smile to open up and show how great they are! 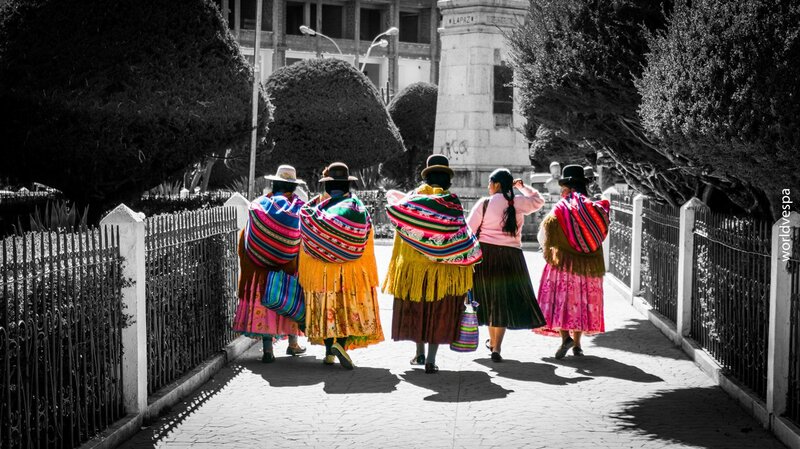 This was Bolivia for us and we were ready now to explore Peru, a country famous for the Inca civilization and for its gastronomy! Πολλά ευχαριστώ!!!!! Είσθε καταπληκτικοι.Μπράβο ρε παιδιά.σαν όνειρο!! Περιμένουμε τα νέα απ το Περού…..
Φιλια κ καλά ταξίδια απ εναν φυλακισμένο στη καθημερινότητα του….